Purchasing the latest episodes of your favorite TV show from the iTunes Store may be more expensive than streaming them from Hulu, but now it’s at least a little easier to collect the full season without paying an arm and a leg, thanks to the new Complete My Season Pass option in iTunes. The new addition was first spotted on Tuesday by a tipster at MacRumors, and resembles the Complete My Album option introduced in 2007 to the iTunes Music Store. It works by letting users who purchased episodes of the latest season of a TV show grab the entire season for a reduced price. 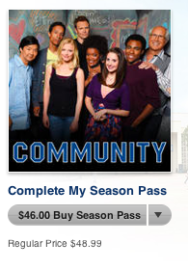 Unlike Complete My Album, however, Complete My Season Pass is only available for current seasons of television—with the exception of a few older ones, cherry-picked by the iTunes Store team—and reduces the price only for the HD Season Pass (those who just want to pick it up in SD will have to pay full price). Still, this does cut down on the total price of purchasing episodes a la carte, especially if you decide that you enjoy the show enough to subscribe to it; in addition, having a season pass guarantees you automatic downloading of the latest episodes, ensuring that you won’t miss any TV hijinks or misadventures.